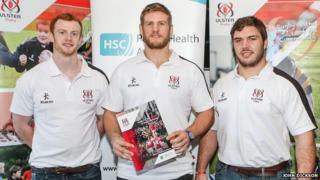 Ulster Rugby have recognised the significant health benefits attached with participation in rugby union by launching a club and community health and wellbeing strategy. Ulster player Chris Henry, who describes his own health scare in 2014 as a "wake-up call", has urged everyone to "keep fit and healthy" regardless of age. "In terms of rugby, give it a try" said Chris Webster, adding, there is a greater appreciation of the "benefits participation in sport brings." Interested in trying rugby? Check out our how to get into rugby guide to find out how.